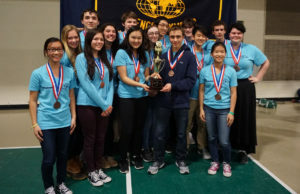 Columbia Science Olympiad has competed at the National Tournament each of the past four years. Columbia’s nationally ranked Science Olympiad team recently received a $2,500 donation from Regeneron to support the STEM-based club. The team plans to use the money to attend prestigious invitational tournaments at MIT and the University of Pennsylvania, as well as buy materials to build helicopters, hovercrafts, towers and mousetrap vehicles. The connection between Regeneron and the Columbia Science Olympiad team runs deep. Over the years a number of Columbia Science Olympiad alumni have gone on to work at the local, cutting-edge pharmaceutical company, including Colleen McGrath ’10 and Erin Maloney ’09. While on the team in 2010, Ms. McGrath was named State Champion in the Chemistry Lab event. She went on to earn a Bachelor’s degree in Biology from Rensselaer Polytechnic Institute, and just returned from six weeks in Ireland where, as Lead Biotech Production Compliance Coordinator, she was consulting at a Regeneron manufacturing site. Ms. Maloney was the Anatomy and Physiology expert on the Columbia Science Olympiad team, earning many top medals. She transferred her love of anatomy into becoming a trained EMT and graduated from Worcester Polytechnic Institute with a Bachelor’s degree in Biology & Biotechnology. Just recently, she was promoted to Associate Manager of Biotech Production at Regeneron. She also traveled to Ireland to help set up the new manufacturing site. With Ms. Maloney the connection to Columbia Science Olympiad is a family affair. Her youngest sister Noelle just recently became a member of the team as one of the elite “Super Sophomores.” Noelle will carry on the family tradition also competing in the Anatomy event. The coaches and members of the team are honored to have such a connection to Regeneron, and hope the partnership will continue into the future.